China’s People Liberation Army (PLA), through a combination of innovation, mimicry, and theft, is developing technology that the Beijing regime aims to use to defeat the United States and dominate the Asia-Pacific region and beyond, according to a recent report by the RAND Corporation. The report, which includes responses from more than a dozen interviews with members of think tanks, academia, and government organizations that have studied the PLA for more than 20 years, explains the situations when the PLA copies foreign technology, and when it develops its own. Most theft and innovation are for immediate political goals, while technology that doesn’t fit those goals is generally ignored. 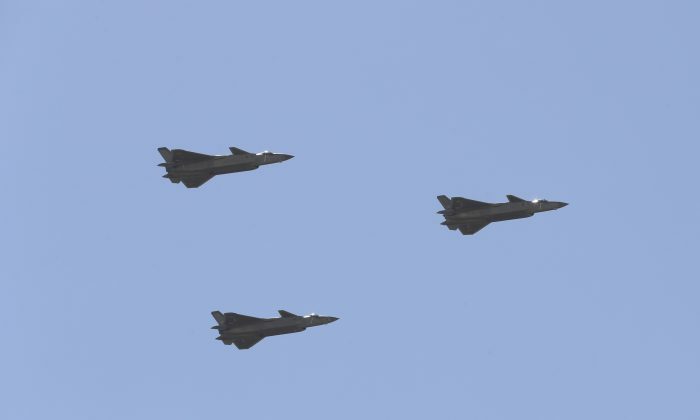 The Chinese Air Force is intent on not just protecting the land it already controls, but to recapture Taiwan and defeat the United States in the Asia-Pacific region, the report says. Future development is aimed toward control of outer space, while currently focusing on satellite espionage, with the Chinese Communist Party (CCP) funding development of both missiles and rockets. While the United States is creating all sorts of technology for all forms of military combat, technological development for the PLA is solely focused on defeating the United States, The PLA also isn’t limited by public opinion or legality, so it can rapidly develop the technology. “The directive from Xi Jinping—that the PLA prepare to ‘fight and win wars’—shows that today’s Chinese armed forces must be prepared to find a way to defeat, not merely compete with, the United States,” the report said. The PLA Air Force (PLAAF) was relatively weak and underdeveloped until 2012. When Xi came to power, one of his main “China Dream” goals was to build a military that could defeat the United States in the Asia-Pacific region. Much of China’s current aerospace technology is a mix of Cold War-era Soviet designs, reverse engineered designs, stolen U.S. designs, and domestically designed space and anti-space weaponry. China chooses to compete with the United States, which has both the top economy and military in the world. While a 2013 USAF report outlined strategic plans for air and space operations, a later PLAAF report was “strikingly similar” in its text, says the report. Much of the PLAAF’s development mostly comes from reverse engineering and theft. One analyst observed that over time, the PLAAF is gaining in similarity to the USAF. Another suggested that they aren’t just copying, but studying U.S. designs; French and Russian technology also is being absorbed by PLA. Reports about China’s new fighters point out that stolen technology from the USAF’s new F-35 showed up in the design. Many of its designs are set up for the Pacific theater, making fighter jets with longer flight times than U.S. versions. That’s because the intent is to defeat the United States in the Asia-Pacific region, and not for performing long-range service, as the USAF does. The designs don’t copy long-range aircraft, as PLAAF appears to only operate out of China for now, focusing on Taiwan and the Asia-Pacific region. Much of China’s innovation is in areas that it can’t effectively steal or reverse engineer technology. Much of its own breakthroughs have been with rockets and missiles. One division, the PLA Rocket Force, looks at any military problem and sees if it can be solved with a missile or rocket. One person interviewed for the report said that ballistic missiles with a range of more than 300 miles were a Chinese innovation. These developments were made for situations where bombers might risk being shot down. These rockets are also being developed with the intent of striking geosynchronous satellites. Much of China’s space development is for espionage and anti-satellite warfare. While the PLA is much more focused on satellites for intelligence-gathering and espionage, the United States uses satellites more often for early warning on ballistic missiles. One analyst said that China wouldn’t be interested in destroying satellites unless it was intending to fight.